The market cap of the Russell 3,000, which contains roughly 98.5% of US stock market cap, is currently at $29.99 trillion. 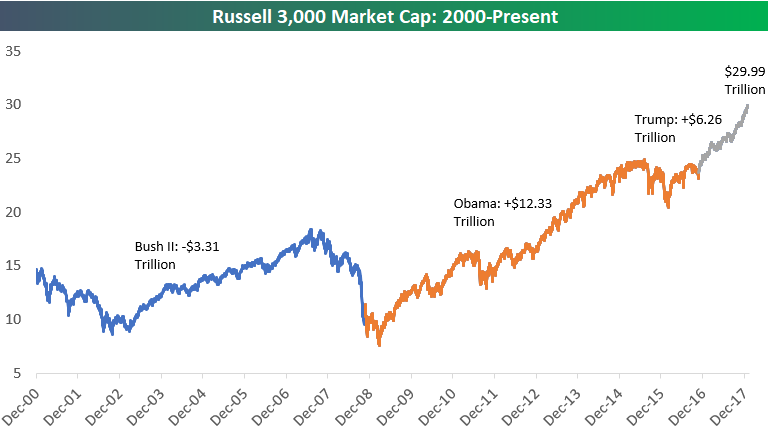 Below is a chart showing the historical market cap of the Russell 3,000 since Bush II officially won the 2000 election on December 12th, 2000. As shown, the index’s market cap ended up falling $3.31 trillion under Bush II due to the Financial Crisis at the end of his 2nd term. Stock market cap grew by $12.33 trillion from the time Obama was elected in November 2008 through November 2016. And finally, US stocks have increased by $6.26 trillion in market cap since Trump won the Presidency on November 8th, 2016. From the low point of the Financial Crisis on March 9th, 2009, US stock market cap has grown from $7.6 trillion up to $29.99 trillion — easily the biggest creation of stock market wealth in history. How Much Higher Can The 'Dow' Go?